"Plea for UNITY" of 1 Corinthians 1:10-13. 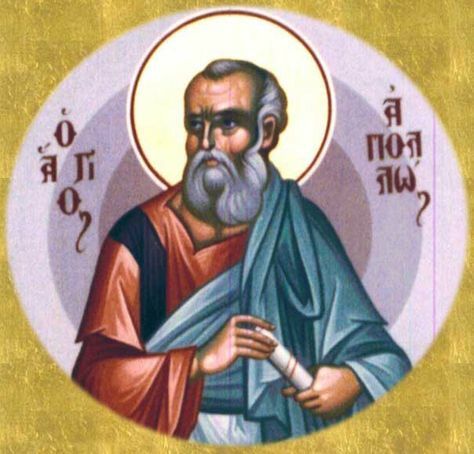 Simon Zelotes (Simon the Pharisee, Zebedee, Lazarus) was a fellow ruler of the Essenes with Jesus and Judas Iscariot, and was almost as old as Theudas-Barabbas. 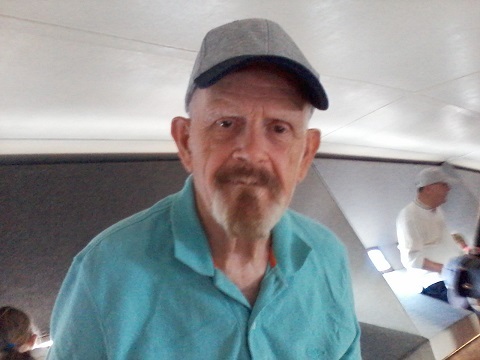 But he was infamous as a Samaritan Magician, had no friends among the Essene leaders other than Jesus, and was not considered for clemency by Pilate. Pilate knew that Jesus had not murdered anyone, and would have accepted another bribe, another 30 pieces of silver, for Jesus' release. 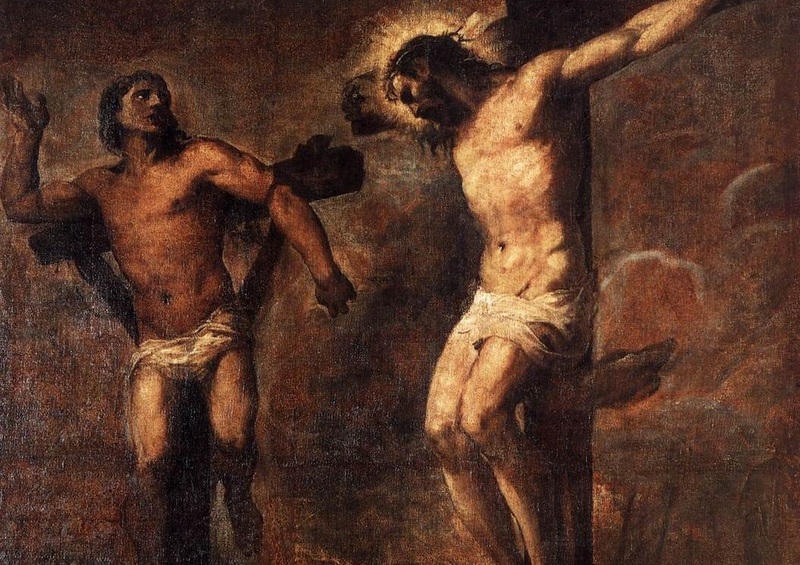 But to the other Essenes, his life was not worth that much money, and they had a secret plan in place to be reasonably sure Jesus would survive this crucifixion with only minor scars anyway. A secret plan that the Jewish scholar and famous author Hugh Schonfield first wrote up in a notable way in "The Passover Plot" (1965). Later in 1976 made into a Hollywood-style Movie. (rated 5 stars out of 10) In Schonfield's book and the Movie, Jesus took poison (TRUE) and survived only long enough for his disciples to claim he had risen again (FALSE), but in the real history, partly revealed by "Gospel Pesher" in Acts, Jesus showed up every few years to Peter and Paul and many others, and made sure the Christian Church got a proper start. Jesus did keep his promise to RETURN -- again and again! Said Jesus to Simon Magus (the "Good Thief") in Luke 23:43 "Verily I say unto thee, Today thou shalt be with me in paradise." On the Day of Pentecost of 33 AD, not long after the crucifixion of Jesus and two others of the 12 Apostles, both Zealots -- Simon Zelotes - Zebedee - Lazarus, and Judas Iscariot (described as "hanging himself" in a partial cover-up of the events) -- Simon Peter is described as being the major speaker and attraction. As an ex-Charismatic, he could and no doubt did practice his glossilalia (Speaking in "Angelic" Tongues -- loudly and all together at once). And for a few months after that, the quiet Christians and the Gnostics cooperated. 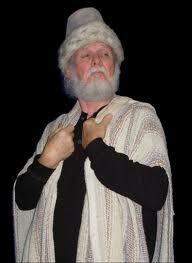 Simon Magus (as "Pope" John), once his broken legs healed, accompanied Peter on a "Holy Ghost Revival" Tour and many were healed in the usual Charismatic manner. This resulted in the celebrated healing of the man with "Palsy" at Solomon's Porch. (A deceptive description of the Essene Quarter). 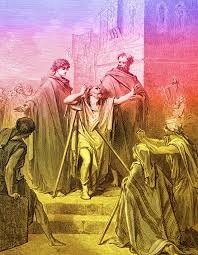 Acts 3:1-9 "Now Peter and John (Simon Magus as "Pope") went up TOGETHER into the temple at the hour of prayer, being the ninth hour. 2 And a certain man lame from his mother's womb was carried, whom they laid daily at the gate of the temple that is called beautiful, to ask alms of them that entered into the temple; 3 Who seeing Peter and John about to go into the temple asked for alms. 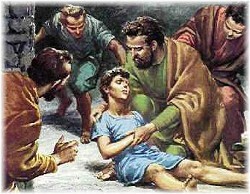 4 And Peter, fastening his eyes upon him with John (good Charismatic Healing technique, said, Look on us. 5 And he gave heed unto them, expecting to receive something (a few coins, perhaps) of them. 6 Then Peter said, Silver and gold have I none, but such as I have give I thee: In the name of Jesus Christ of Nazareth rise up and walk. 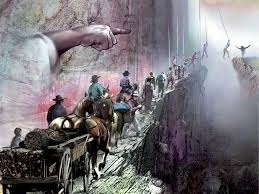 7 And he took him by the right hand, and lifted him up: and immediately his feet and ankle bones received strength. 8 And he leaping up stood, and walked, and entering with them into the temple, walking, and leaping, and praising God." 9 And all the people saw him walking and praising God." 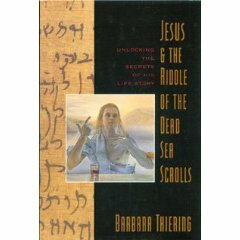 Dr. Barara Thiering PhD, an expert on Essene calendars and on "Gospel Pesher" was able to determine for her 1992 book "Jesus and the Riddle of the Dead Sea Scrolls" that Jesus brother James was the "Lame Man" begging alms here (the Essenes were always "begging alms". And that he could be called "lame" because he was just entering a 4-year betrothal period. Jesus figured out a way, by stretching some Essene rules, that his younger brother James could still attend religious meetings during this time period. Thiering also figured out that this was the time, Tuesday September 1 of 33 AD, when the broken legs of "Pope" John (Simon Magus) were now healed enough for him to accept and perform all the duties of an Essene "Pope" -- and that Simon Magus as "John" was back in the same position as he had held before both Jesus and he were crucified. Only Judas Iscariot actually died at that crucifixion. And then only because someone pushed him out of a window in a cave because he had betrayed the other Essenes involved. 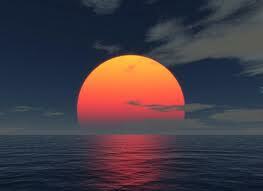 The "honeymoon" between Gnostic and non-Gnostic Essenes didn't last very long. It ends on September 16, 35 AD (after 2 years) with the excommunication of Simon Magus by Simon Peter at the new Cesearea Essene Center. Symbolically acted out by the sudden and unexpected "deaths" of Simon Magus and his live-in female Essene partner Helena (Martha) temporarily given the names Ananias and Sapphira for this excommunication ceremony. The story, completely fiction of course, is told in Acts 5 -- and since I've already given you the plot, I trust you're smart enough to fill in all the details. And some of you at least will quit quaking in your boots waiting for God to strike you dead for not paying up some money you promised your church way back when you were younger and more susceptible to Religious Blackmail. After this incident in September of 35 AD, Peter and his church re-defined the Holy Ghost or Holy Spirit in a way in which the leaders of the church could control all of the religious opinions and spontaneous actions of their congregations, and the long dark night of total religious conformity began. So, in a way Simon Peter was indeed the first totally Roman Catholic "Pope" -- no one else having the right or inclination to question his authority -- if he was wearing the right hat, and sitting in the proper chair! In 58 AD, over in Ephesus, the Gentile world was being evangelized (with Jesus' permission and occasional help) by Saul of Tarsus now known as the Apostle Paul. A student of Simon Magus ("Ananias") after his excommunication (death) at the hands of Peter (along with 'Sapphira") was gaining fame by his eloquence and "fervent spirit". 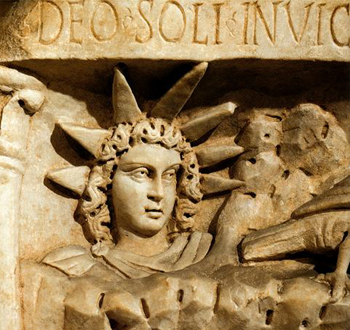 His name is given as Apollos, but since that is the name of the Greek and Roman SUN-GOD, we have no way of knowing what his real name was or is. And since the SUN never dies, but lives forever, this guy named Apollos may still be around making a lot of noise and striving to create havoc within various religious groups. Could be anyone. Perhaps even me. Or you. But I must move on. Paul could have "killed" (excommunicated) Apollos as Peter had done to Ananias and Sapphira in Caesarea, but he didn't, instead only pleading for his followers to maintain UNITY. 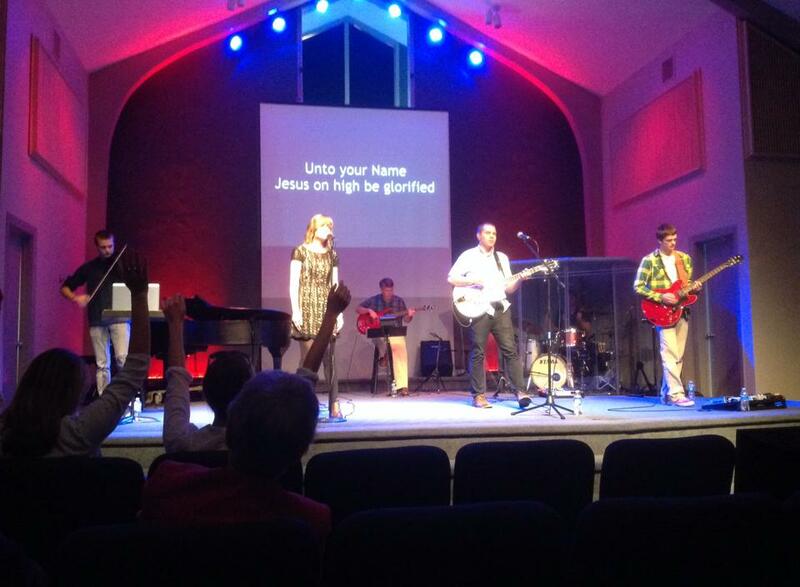 So here we are in a Christian Church without the hoped-for UNITY. 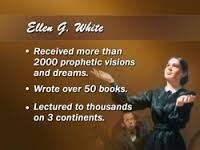 Even though Seventh-day Adventists have done their part by limiting the Holy Ghost's utterances to only Ellen White's writings and decisions made at duly called sessions of the General Conference. That Theudas and Apollos both had the same EGYPTIAN Theology seems obvious when we read the summary in Acts 5:36 of Theudas' former activities, and note that he was the leader of exactly the same number of armed men (400) before Judas the Galilean, that "the Egyptian from Alexandria" led as an armed group of demonstrators to Jerusalem as JERICHO in 58 AD as recorded by Josephus in "The Antiquities of the Jews" Book 20, Chapter 8 (169)' . I'll not here duplicate what I've given my readers in my pages marked Solar-3, but you should read Solar-3, by clicking here --then return HERE to read on about the different Theology in this New Testament Book, which was, indeed written by Apollos, not PAUL, which is the assumption made by most people. 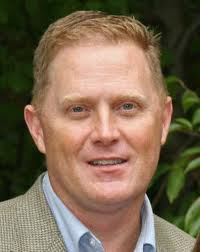 Patrick Williams in his sermon of September 2, 2017 did mention that some people did believe that Apollos wrote "Hebrews" but Patrick himself credited the book to the Apostle Paul. Hebrews "Written to the Hebrews from Italy by Timothy" . 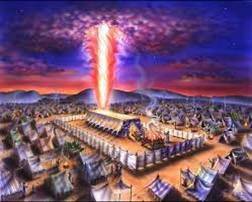 "Hebrews appears to have been written in Italy (13:24) about AD 62-14. No one knows positively who wrote the Epistle. The author is not mentioned as in Romans 1:1 (Paul), 1 Peter 1:1 (Peter), and James 1:1 (James the brother of Jesus Christ). But many believe it is by Paul--" The Pilgrim Study Bible - Oxford U. To know with any certainty that Apollos not Paul wrote Hebrews we must turn once again to Dr. Barbara Thiering PhD with her knowledge of REAL DATES, and the DOUBLE MEANINGS that the Essene authors used for Greek Words, applying them to specific groups of Essenes. She tells us on pages 71-72, 85, 128, 255, and 376 who the group called "Hebrews" consisted of. And who the man named Apollos really was, and what he was doing after AD 44. 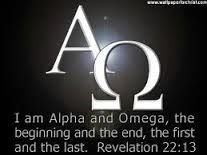 That Apollos took over the leadership of the group known as "The Egyptian Therapautae" from Theudas (Barabbas, Nicodemus, Thaddaeus) in 44 AD is documented by Dr. Barbara Thiering PhD on page 386. The death of Theudas (Barabbas, Nicodemus, Thaddaeus) is documented by Josphus in "Antiquities of the Jews" Chapter 20 (97) "Now it came to pass, while Fadus was governor of Judaea, that a certain magician, whose name was Theudas, persuaded a great deal of the people to take their effects with them, and follow him to the river Jordan; for he told them he was a prophet, and that he would, by his own command, divide the river, and afford them an easy passage over it. (98) and many were deluded by his words. However, Fadus did not permit them make any advantage of this wild attempt, but sent a troop of horsemen out against them: who falling upon them unexpectedly, slew many of them and took many of them alive. They also took Theudas alive, and cut off his head, and carried it to Jerusalem. 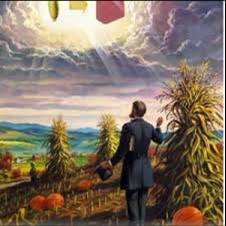 (90) This was what befell the Jews in the time of Cuspius Fadus's government." 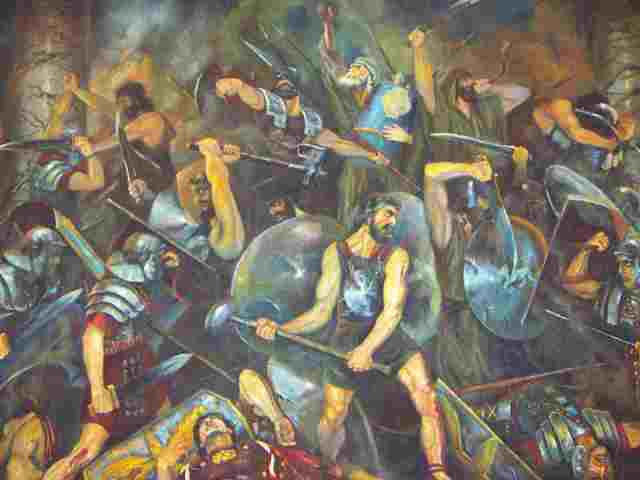 The fact that I could find this picture of the actual battle in which Joseph the father of Jesus Christ's friend and Zealot partner Theudas, who was almost 40 years later an Apostle of Jesus was vanquished and publically beheaded, the battle of 44 AD, is to me a stroke of good fortune. And that the number of 400 soldiers of before 10 AD (Acts 5:36) matches exactly the 400 soldiers of 58 AD for Theudas's successor Apollos (Antiquities ch. 20 (169) goes a long way towards shoring up my confidence in Thiering's historical theories and time-keeping methods. 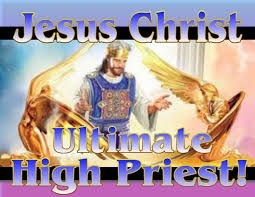 It is because of the very different role of Jesus Christ as a Jewish "High Priest" in Apollos' book titled Hebrews instead of the Trinitarian God promoted by the Roman Catholic Church for 15 or 16 centuries, that Hiram Edson, of Port Gibson, NY, only a day or so after the Millerite "Disappointment, had what he called a "vision" in his corn field of Jesus as a Jewish High Priest officiating on a "Day of Atonement" in a Tabernacle not unlike that shown on the right. The Book of Hebrews is full of such "High Priestly" language and symbolism, -- so much a part of the rituals and worship of the "Egyptian Therapautae" that both Theudas and Apollos were willing to risk both their own lives and the lives of their followers on these symbolic acts. And of course the 19th and 20th centuries have seen, time after time, similar date-setting and risky behavior, but with less actual loss of life. In her chapter on "The Final Journey", which begins on page 157, Barbara Thiering shows that Apollos was on the same boat with Paul, and Luke, and Jesus Christ, and Peter (as "Aristarchus the Macedonian") as they all travelled to Rome in 60 AD. 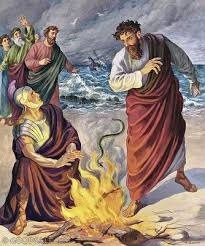 It was at 4 PM at a campfire on the Island of Malta in the Aegean Sea on January 1, 61 AD, that Apollos makes a move to poison Paul with some snake poison, the "viper" in the story that Paul shakes off into the fire. Acts 28:4 "And when the barbarians saw the venomous beast hand on his hand, they said among themselves, No doubt this man is a murderer, though he hath escaped the sea, yet vengeance suffereth not to live. 5 And he shook off the beast into the fire, and felt no harm." Thiering, by looking at the previous history in Acts and Josephus, along with the Essene "Pesher" knows now that Apollos is on this trip to be himself tried before the Emperor Nero for leading the demonstration in 58 AD in which so many of his followers were killed, and in order to hope for some clemency from Nero, hopes to get Paul, his competitor and enemy, blamed for a part in Governor Festus' murder of Jonathan Annas the Essene High Priest (Stephen in the "Stoning of Stephen" story). Paul, you'll no doubt remember, was supposedly responsible for the deaths of many Christians before he had his "vision" on the road to Damascus in 40 AD, 21 years prior to this trip to Rome in 60 and 61 AD. 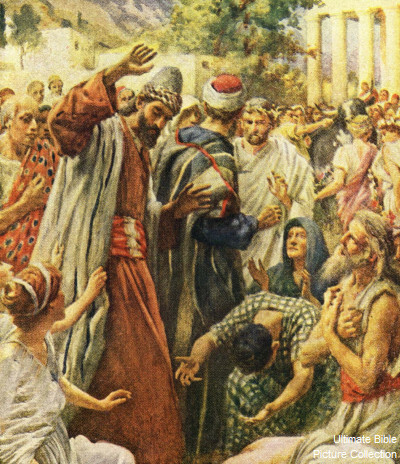 Going back now 23 years to the "Stoning of Stephen", which occurred in September of 37 AD, 2 years and 3 months before Paul's "conversion" in February of 40 AD, Saul of Tarsus is described as participating with the Anti-Stephen crowd doing the "stoning". Acts 7:58 "And (the executioners) cast him ("Stephen") out of the city, and stoned him: and the witnesses laid down their clothes at a young man's feet, whose name was Saul." Actually this was not a real "stoning", not a real execution, but only a symbolic one. 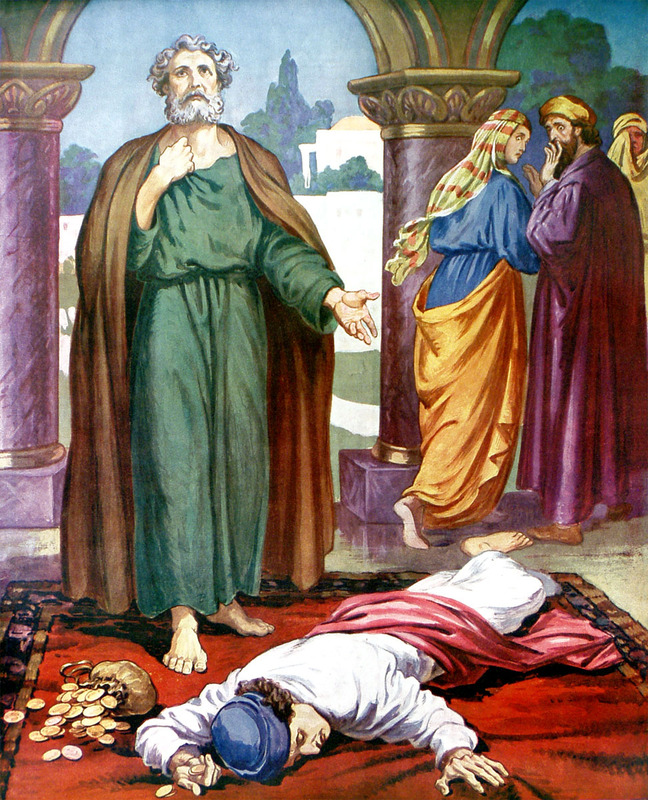 Jonathan Annas ("Stephen") was excommunicated after his long speech of Acts 7:2 to Acts 7:53. After "playing dead" by staying in a cave for several days, he returned to private life while his brother Theophilus Annas (to which both Luke and Acts are dedicated) carried on the duties of "High Priest" at Herod's Jerusalem Temple. However, Josephus, in Antiquities of the Jews Chapter 20 (162) shows that the Roman Governor Felix did order "Stephen" (Jonathan Annas) to be killed by the Sicarii). Nero, at the ensuing trials in 61-62 AD, listened to both Apollos and Paul's arguments, and though Paul gained several more years of relative freedom, by the summer of 64 AD, after the Great Fire of Rome, the vain and corrupt Emperor Nero used the Christians as scapegoats, and large numbers of them were crucified, including Peter, crucified tradition has it, upside down at his request. Paul was beheaded, the same death that Theudas suffered. And Apollos? So far as I know, he may be still alive! Anyway, in spirit he's still here. Especially so since August 21, 2017.